The de Young Museum in San Francisco is the city's flagship art museum, but don't let that lofty description put you off. Visitors to the de Young find lots to see, including a collection of art that includes works from 17th- to 20th-century America, the native Americas, Africa, and the Pacific. The de Young Museum also hosts most of the important special exhibits that come to San Francisco. Their curation is excellent for both presentation and explanation. 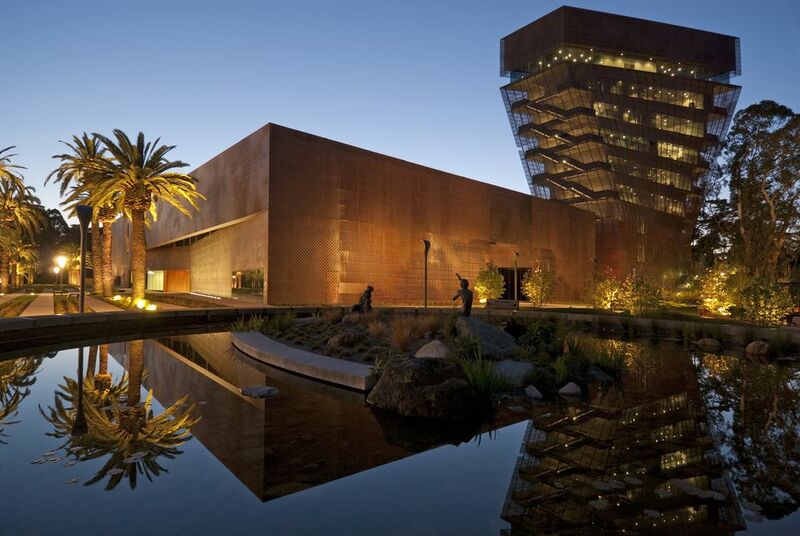 Check the de Young exhibit schedule to find out what's coming up when you visit. The de Young has been around since 1895, but the current facility was completed in 2005, designed by Herzog & de Meuron and San Francisco's Fong & Chan Architects. People either love or hate the building itself, but everyone agrees that views from the observation tower are great. In fact, the tower is a don't-miss part of the museum and is open to the public without an admission ticket. All you have to do is get there at least an hour before the museum's closing time and walk through the lobby to the tower elevator. You can also get into the museum's excellent gift shop without buying a ticket. The de Young Museum doesn't allow baby carrier backpacks (unless they convert to the front), but strollers are fine. Ticket counter lines are rarely long, but you can buy your tickets online before you go to avoid any waiting. If you visit the de Young and its sister museum the Legion of Honor on the same day, you'll only have to pay one admission fee. To dodge the crowds at popular exhibits, go at the latest entry time and go slow, staying at the end of your group. The Museum Café is a good place to get a bite to eat, and it's a good place to view the Barbro Osher Sculpture Garden. It closes about an hour before the museum does. To get more out of your visit, you can rent an audio tour or take a free docent tour. Or do it at your pace: Download their app which gives in-depth insights into more than 30 of their works. The museum's rules about what you can bring in and what you can do inside are typical for art museums, but there are few things you can't stow in their coast-check area, so you might want to check the policies before you go. The museum is open most days of the week, except major holidays. You can find their operating schedule on the de Young Museum website. They are also sometimes open late on Friday evenings, with music and local artist demonstrations. You don't need a reservation to visit the de Young except for special exhibits, which require a separate, timed-entry ticket. The museum charges a general admission fee, but children under six years old get in free. The museum also offers monthly free days for the general public. Check the schedule for free days on their website. The de Young Museum is on the east end of Golden Gate Park, near the California Academy of Sciences, The San Francisco Botanical Garden, and Japanese Tea Garden. If you drive to the de Young Museum, enter the underground garage at Fulton Street and 8th Avenue. You can park for free on streets nearby, but on a busy day, it's a frustrating search that is best avoided. The most convenient places for street parking are John F. Kennedy Drive near the Conservatory of Flowers or Martin Luther King Drive. Find several ways to get there by car. Parking fills up on weekends, and some nearby streets are closed to automobiles on Sunday. Using public transit is not only convenient but if you keep your pass or transfer to show at the ticket desk, it will save you money on museum admission. Check public transit options.